RepRap has now surpassed the commercial Fused Deposition Modeling (FDM) 3D printers in machine affordability, price for filament, speed, and print quality. 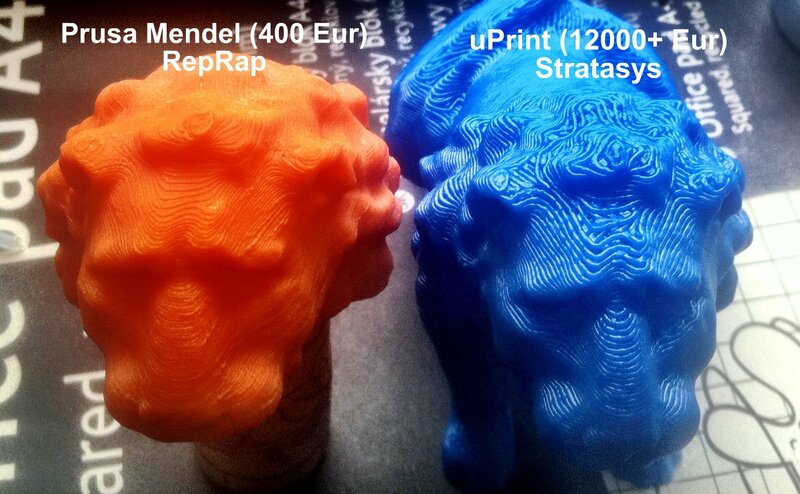 See http://blog.reprap.org/2011/09/tipping-point-of-print-quality-open.html and the image below. A EUR 400 piece of simple hardware+software (which you can build at home) beating EUR 12,000, through collective and fully open source innovation over a mere 6 1/2 years. This drastically lowers the cost of producing prototypes and custom (or just small run) plastic items. New design tools have also been developed, including the ability to describe an object using a language, which makes editing object designs much easier as well. I’ve been following the RepRap’s progress for years, and co-funded the building of an earlier model in Brisbane. The disruptive potential of this technology is tremendous! Duplicating existing items is easy, but not very interesting – how about printing things that you would previously not consider. I’ve written about it before – we need to adjust our thinking to this new reality and make smart use of it. It is, to quote Chris DiBona, like “China on your desktop”. But better and more flexible.